In recent years, groundwater (GW) is becoming increasingly important due to population growth, preparation for climate change, flood control, and above all water quality awareness. While in far and recent history most of the water for agricultural and domestic use was of surface origin, in the recent few decades, the portion of groundwater used in many countries is significantly higher than the portion of surface water used. This makes the study of groundwater and related fields such as vadose zone hydrology, subsurface contaminant fate and transport of high importance. Central Intelligence Agency (CIA). (2012a). The world factbook (West Bank). Retrieved May 2012, from https://www.cia.gov/library/publications/the-world-factbook/geos/we.html. Central Intelligence Agency (CIA). (2012b). The world factbook (Gaza strip). Retrieved May 2012, from https://www.cia.gov/library/publications/the-world-factbook/geos/gs.html. Israel Meteorological Service (IMS). (2012). Daily evaporation rates. Retrieved March 2012, from www.ims.gov.il. MEKOROT website. (2012). Retrieved March 12, 2012, from http://www.mekorot.co.il/Eng/Activities/Pages/WastewaterTreatmentandReclamation.aspx. Ministry of Agriculture (MoAG). (1959). 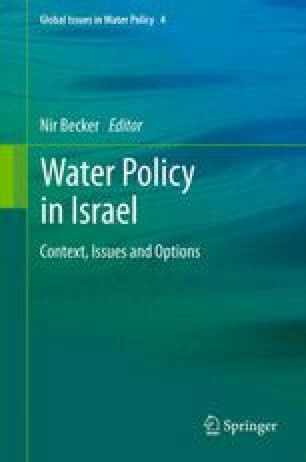 The Israeli water law. Retrieved February 2012, from http://www.water.gov.il/Hebrew/about-reshut-hamaim/Pages/Legislation.aspx (in Hebrew). Ministry of Health (MOH). (1995). People’s health regulations (in Hebrew). Retrieved March 2012, from http://www.health.gov.il/LegislationLibrary/Briut07.pdf. The Israeli Water Authority (IWA). (2012). Water use by target 1996–2010. Retrieved February 2012, from http://www.water.gov.il/Hebrew/ProfessionalInfo-AndData/Allocation-Consumption-and-production/20091/1996-2010.pdf (in Hebrew).